Two astronauts battled through an extra-long spacewalk outside the International Space Station today (Aug. 30) to replace a broken power unit and other broken gear on the orbiting lab's exterior, but were ultimately stopped short by a set of stubborn bolts. NASA spaceflyer Sunita Williams and Japanese astronaut Akihiko Hoshide wrapped up their spacewalk after spending 8 hours and 17 minutes outside, making it the third longest spacewalk in history. The outing began this morning at 8:16 a.m. EDT (1216 GMT). During the marathon eight-hour excursion, the orbiting complex passed over Tropical Storm Isaac, which was recently downgraded from a hurricane after mercilessly hammering the state of Louisiana and the U.S. Gulf Coast with severe rain and wind over the past two days. While Williams and Hoshide did not complete all of their assigned tasks, they were forced to conclude the spacewalk after struggling to no avail with a bolt on a replacement power unit. As a temporary fix, the astronauts used a special tether to tie the component to the exterior of the International Space Station. As Williams and Hoshide worked outside today, their orbiting home passed over the southern United States, where Tropical Storm Isaac looms large, and remains a threat to several states, including Mississippi and Louisiana. "You're going to be coming right over the top of it," flight managers radioed from Mission Control at NASA's Johnson Space Center in Houston. NASA originally hoped to observe the storm from cameras mounted on the space station and on the spacewalkers' helmets, but the day's packed schedule prevented them from taking a short break to snap photos of the punishing storm from space. Occasionally, these bolts can be difficult to loosen, since many were installed a while ago and have not been touched since, NASA spokesman Josh Byerly said in his live commentary of the spacewalk. At the beginning of the excursion, Hoshide had difficulty unscrewing two bolts to remove a failed power box, called a main bus switching unit (MBSU), which relays power from the station's solar panels throughout the orbiting outpost. When the MBSU was finally pulled out, mission controllers joked that Hoshide could consider a portion of his monthly exercise quota now complete. Hoshide then rode on the end of the station's 58-foot (17.7 meters) robotic arm to attach the old unit to a temporary storage platform and to retrieve a replacement. After that, Williams and Hoshide worked together to install the new spare, but the bolts again gave them grief. "It's throwing a wrench in our timeline," mission controllers said, as the spacewalk approached the five-hour mark. "We've tried almost every back-up we have on this stupid bolt," mission controllers radioed shortly after the spacewalk passed the 6.5-hour mark. Despite the long outing, the spacewalkers reported feeling well, and controllers on the ground closely monitored the batteries and various systems inside the spacesuits. "Consumables look fantastic," mission controllers said. "How do you guys feel?" "Good," Williams said. "Better than the MBSU." Earlier in the spacewalk, Williams was able to successfully install cables along the outside of the space station to prepare for a new Russian laboratory module that is slated to launch to the orbiting complex in 2013. At one point, Williams was required to crawl inside a part of the station's backbone-like truss to connect the long cables. But despite the problematic bolts, the spacewalkers soaked in the experience and marveled at the spectacular views. "Whew! 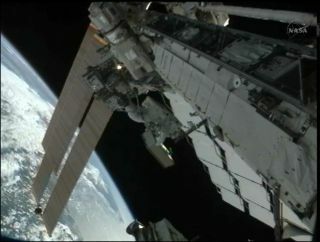 It's beautiful out here," Hoshide said while riding on the space station's robotic arm. Because of the finicky bolts, Williams and Hoshide did not have time to remove and replace a faulty camera from the station's Canadarm 2 robotic arm, but NASA officials said the task can also be added to the itinerary of a future spacewalk. Still, mission controllers made sure to congratulate the duo on completing a tough spacewalk. "You guys are rock stars, just so you know," they radioed from Mission Control. Today's outing was NASA's first spacewalk in more than a year. The last time American astronauts ventured outside the International Space Station was in July 2011, when former station residents Mike Fossum and Ron Garan made upgrades to the orbiting complex during NASA's final space shuttle mission. The excursion was Williams' fifth spacewalk and Hoshide's first time working outside in the vacuum of space. Hoshide is now the third Japanese astronaut to have performed a spacewalk. The outing is the third this year, but only the second spacewalk of the station's current Expedition 32 mission. Two Russian cosmonauts previously performed a nearly six-hour spacewalk outside the space station on Aug. 20. In addition to Williams and Hoshide, the station's six-person crew includes Russian cosmonauts Gennady Padalka, Yuri Malenchenko and Sergei Revin, and NASA astronaut Joe Acaba, who assisted the spacewalkers today by driving the station's robotic arm.